The Northern California Megaregion, Development in the NSJV and its Small Businesses sponsored by JPMorgan Chase & Co.
Pacific’s Center for Business and Policy Research (CBPR) will present the second annual North San Joaquin Valley (NSJV) Index that tracks indicators of economic prosperity and sustainability for the 3-county NSJV region. The presentation will highlight emerging and developing economic issues across the region and include economic and demographic outlooks. CBPR will also present a brief overview of NSJV small business indicators and will moderate small business panel discussion. The Bay Area Council Economic Institute will present its report exploring the many rail, road, labor, goods movement, and innovation connections that currently exist between the Bay Area, the NSJV, the Monterey Bay Area, and the Sacramento Area. 9:55 - 10:30 AM The North San Joaquin Valley Index – Sponsored by JP Morgan Chase & Co. This Event is Free to those who Pre-Register. Please note you do not need to bring a printed ticket. 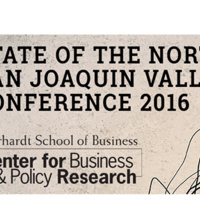 Have questions about 2016 State of the North San Joaquin Valley Conference?